You can set Excel 2011 for Mac to change the format of a cell, cell range, table, or pivot table based on conditions you specify. Use these settings when you want a cell’s appearance to change as the result of a formula or when someone types in a worksheet. 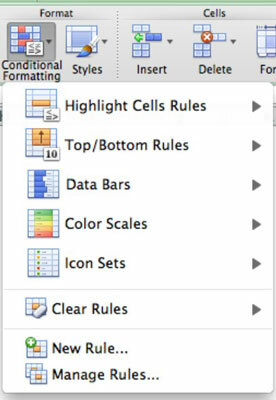 Conditional formatting was improved in many ways for Excel 2011 for Mac. There are more conditions from which to choose. Conditions can be external to the cell you’re formatting, and conditions can be based on criteria on other worksheets. Excel 2011 has new formatting options, such as borders, solid fills, icon sets, plotting negative values, and data bars. There are billions of possible combinations, but there are five major styles of conditional formatting, which you can find when you go to the Home tab’s Format group and click the Conditional Formatting button. Each option has a submenu, palette, or dialog associated with it. If you apply a rule to a data set and then apply another rule, both rules will be in play. Use the Clear Rules option near the bottom of the Conditional Formatting pop-up menu to remove conditional formatting. If you select a cell, cell range, or table before choosing an option, the formatting you apply will affect the selection. If you do not make a selection first, the conditional formatting applies to the entire worksheet.